Usually I name my crayon dragons on the drawing. I think this one’s name is Kissa. Should have put her name into the flames, actually. Wrote a script for a comic that had been blooming in my mind for a few days and then started to second-guess myself and decided to check my sources, so to speak, before drawing it. Certain recent events weigh heavily. Anyway, I couldn’t have done justice to the subject matter in the time available. Instead, I settled on something I used to do all the time, and haven’t done in a while: dragons in crayon. And still, you would not believe the tribulation. I wanted to sit on the floor, but had to adjust the lamp to shine on my workspace. But somehow, I knocked the lamp over, breaking the bulb. Fortunately, although it cracked and no longer emitted light, it stayed in basically one piece and was easy to remove. Then I went to the closet and got another bulb, but it was so well-packaged that I had difficulty getting it out of the protective packaging. Eventually, I dismantled the entire box, but the bulb was still secured in the cardboard. So I gave it another tug, and it went flying across the floor, shattering into a million pieces. Now I had to get another bulb and install that just so I could see well enough to sweep and vacuum the broken glass in order to safely sit on the floor. Probably end up mad as a hatter anyway. Finally, I was able to draw this majestic mother dragon guarding her precious egg atop a golden hoard. Classic. Per usual, I would be eternally grateful if you considered supporting QWERTYvsDvorak by buying my book, supporting my Patreon, or ordering my merch. 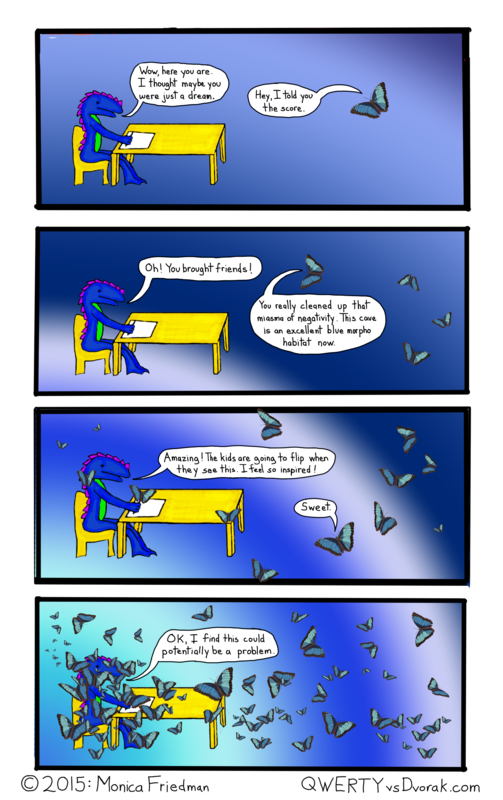 This entry was posted in Dragons and tagged comics, crayon, dragon, drawing, egg, gold, hoard, mother on July 1, 2016 by littledragonblue. The work of the child is to play. As threatened, this day was spent in taking a commuter train into a big city for no particular purpose except to entertain children. The children were entertained. They very much enjoyed the train ride. When we arrived in the big city, the children wanted to eat. Although this big city, like all big cities, is known for offering a wide variety of excellent cuisine, we ate at the food court in a mall. It was an upscale food court, but it was a food court. We walked past some very interesting food trucks and a few famous restaurants in order to eat at this department store food court. Then we walked on to what is possibly the finest urban playground $55 million can buy. When completed, this playground will cover an astonishing twenty acres land. Even in its unfinished state, its structures are too many to easily count. We didn’t even visit every section of the playground, let alone use every piece of equipment. The slides are without number, and some of them are sort of ridiculously fast. Above, you can see a good chunk of an actual tube slide, on the inside of which I hit my head the first time because it’s hard to navigate that sort of curve while protecting a small child on your lap. You can only see a fraction of the climbing structure you need to maneuver through to read the tube slide. The structure is deliberately designed to make it fairly difficult for full-size adult humans to reach the top. I am a good bit smaller than a full-size adult human and it was tight. 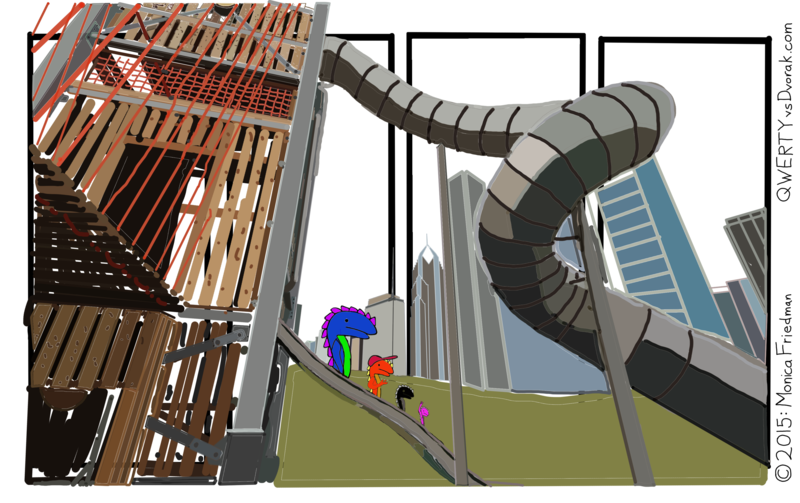 In the picture, Dragon and a trio of dragonets slide down one of the more conservative slides. In the picture, Dragon and a trio of dragonets have the entire park to themselves, which, as you can imagine, is not the case with the actual park, which is filled with hundreds, perhaps thousands of children and their parents. 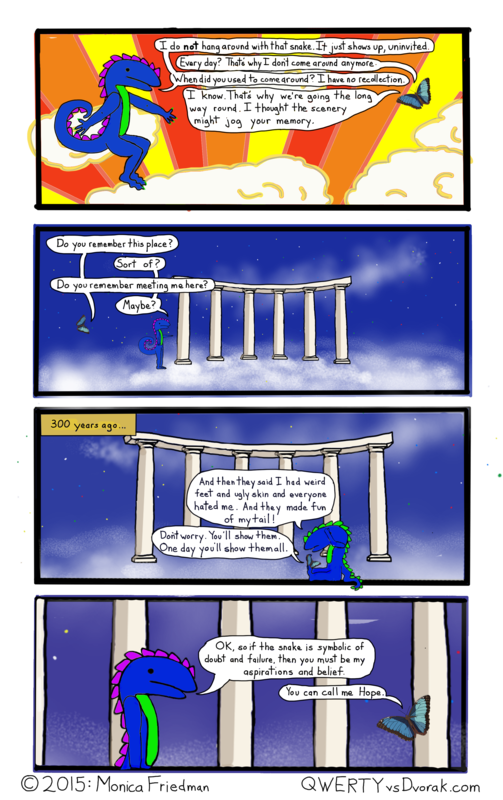 This entry was posted in comic, dragon comics, Dragons and tagged comics, dragon, drawing, kids, playground, slide, webcomic on March 31, 2015 by littledragonblue. This is part of the child mind, the beginner mind, to approach the task with a sense of innate wonder. Every time, there exists a moment of awe and a feeling of newness, a joy in the process and another at the outcome. It doesn’t matter what anyone outside of that experience thinks, and anyone inside the experience will witness it with the same breathe of amazement. What comes after, when the internal, made external, moves through the rest of the world, does not change these sensations. What comes after, when the world passes judgement, has no impact on the artist or the creative process. Another night when I started too late and my head has gone all swimmy such that the screen is blurry. Comic: that’s all. 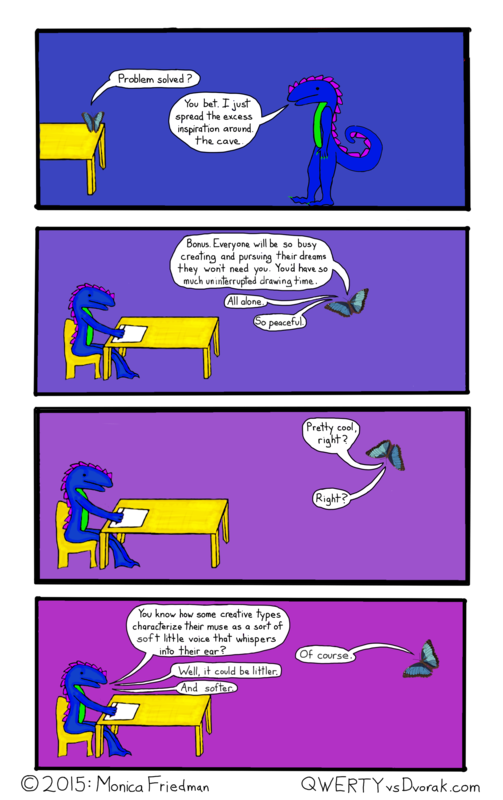 This entry was posted in dragon, dragon comics, Dragons and tagged art, beginner's mind, child, child mind, dragon, drawing, kids, webcomic on February 20, 2015 by littledragonblue.